This race took place in Ypsilanti, MI at Rolling Hills Park. I had never been there before and was pleasantly surprised about the park. It was nicely groomed and even more important, had a warm building that we could hang out in! It was 17 degrees that morning and the warm building was much appreciated. When you register for this race, you can choose a santa outfit or an elf outfit. I chose the elf shirt with hat and Troy chose the santa shirt and beard. I thought that this was very cute to help get into the Christmas spirit. A great part of this event was that they were donating to Toys for Tots so you were encouraged to bring in a toy to donate. We arrived to the park about 45 minutes before race time and realized that it was going to be a small race- which we were okay with! It started right around 9 AM and took us all around the park. In the beginning of the race, Troy and I ran together and were in 1st place together. Then, Troy fell back a little bit and another guy came up from behind and I hung with him most of the race. It took us through this large park. The rolling hills were no joke! It was a pretty hilly course! The only negative that I can say about this race is that for me, this race was 3.55 miles and the way most people took, was 4 miles. This was disappointing because we expected it to be 3.1 miles. We expected the race to be over at that point and it kept going through the woods! That was okay though. After the race, trying to catch my breath! I ended up in 1st place overall which I was very happy with. My time was 24.57 (due to the extra distance added). Troy came in third place which was awesome. I was very proud of his mile times which averaged 7:15. He does not run very often at all so I could not believe how well he did. The people who were working the race were very energetic and happy at the finish line which was great. Troy and I both got awesome Go Santa Go travel mugs as prizes. Troy and I very focused! Amanda Hernandez, 24, a registered dietician and graduate student of Western Michigan University, was the winner of Go Santa Go 5k race finishing in under 25 minutes. Her husband attends Eastern Michigan University. When it came to getting to the finish line, Hernandez, who participated in the Halloween Run and Hot Chocolate Run in the past and placed high in those races, had a few strategies up her sleeve. 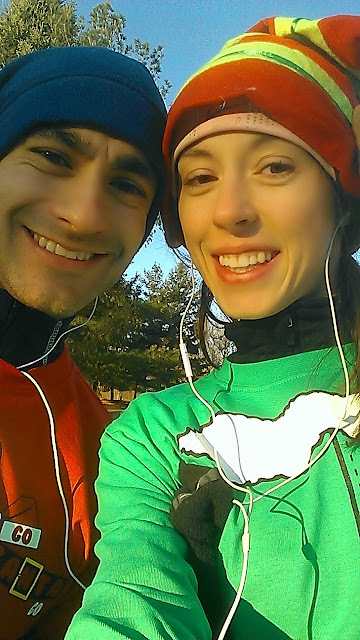 Hernandez and her husband enjoy racing for fun and after finding out about the event online, they thought it would be a fun way to remain active during the winter time. “I think it’s motivation to train because otherwise with this cold weather, it’s easy to skip training, so races help me,” she said. This was a great race and I would participate in it again! Disclosure: I was provided with free entries into this race. All opinions are my own. Also, photos borrowed from the Go Santa Go site.